People come to mediation when an issue is important to them, so it is critical to work with a mediator who will persevere in finding a satisfactory solution. The best settlement is one to which the parties can say a heartfelt “yes”. The mediator who is prepared to look beyond the goal of simply settling the case quickly can help the parties achieve real resolution and closure. My goal is to help you save time, money and the grief of having to go to court. I provide a safe, constructive forum to help you resolve your personal or professional disputes. I can help you determine your own future, instead of having important decisions that will affect your life being made by a judge or jury. If you contact our Tampa Bay firm by phone or email, someone will be happy to assist. 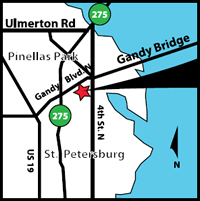 Our St. Petersburg office is convenient to all of Tampa Bay, located 1/8th mile south of the Gandy Boulevard and 4th Street intersection. All major highways (I-275, US 19, Gandy Blvd.) are accessible within minutes. The office is located within fifteen (15) minutes of the Pinellas County Courthouse (6 miles) and twenty (20) minutes from the Hillsborough County Courthouse (16 miles). We are fifteen (15) minutes from Tampa International Airport (13 miles). The office has several conference rooms and is the perfect location to meet with your clients. If more structure is needed, an office with shared receptionist is available which can be booked by the hour, day, week or month. If you have a chosen mediator, but no facilities, other mediators are welcome to book our available mediation and/or conference rooms. With proper identification, we are also available to assist your clients in having authorizations, interrogatories, and other documents notarized. Just Call (727) 623-9080 for other services in the Tampa Bay area and/or to schedule statewide mediation services.